He Holds My Right Hand: Praising God Today for His Protection of My Other Mother! Praising God Today for His Protection of My Other Mother! 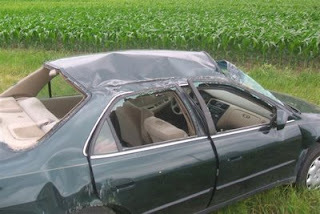 My husband's mother was in a car wreck last night. Someone sped through a stop sign and hit her car on the tail end. Mom's car turned around and ended up rolling at least 2 or 3 times. All the windows were broken. Mom was wearing her seatbelt, like always. The hospital kept her for observation last night but, so far, she seems to be okay (aside from a goose egg on her forehead and a few other bumps and bruises.) The Lord's angels were definitely watching over her. Mom saw the other car coming and veered away. If it hadn't been for that, she could have been hit square on the driver's door. Things would have been a lot worse. Thank you, Lord, for your protection!